A how to guide and place to disseminate activism for Palestine. 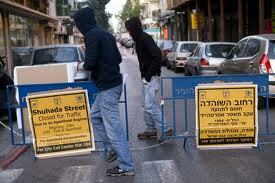 3rd annual Global Day of Action to Open Shuhada (Apartheid) Street! As we have done for the past few years, we urge all people who are against Israeli Apartheid in Hebron to organize solidarity actions on February 25, 2012. Below is a list of suggested solidarity actions that we hope you will consider. 4. Twitter: Use this hashtag #OpenShuhadaSt to spread the word and educate the masses about Hebron. This is especially important during the week of actions. 5.Video Message: Create and send video messages to community forums, media, and social media outlets urging the international community to use diplomatic pressure to re-open Shuhada Street. 8.Close roads to show the public the effects of closing the main road in Hebron. 9.Visit Hebron to gain an understanding of the situation and the daily suffering of the people living there. 10. Any other non-violent activity you feel supports the cause, be as creative as possible!! Please reply to let us know if/how you plan to participate! Arab Prisoners in Zionist Jails. The true intentions of the Zionists , in thier own words..
Videotaping Police How To – 7 Rules For Recording Police – Know Your Rights!